Share the inspirations of animals and nature and everyday life. No “Add to Cart” Button? Near me, the leaves are beginning to change color in earnest, and autumn rain has been falling. In this experimental oil pastel from 2000, using oil pastels with turpentine to soften and blend them, I tried my best to capture that sense of the blazing white trunks and leaves against the woods darkened by overcast and rainfall. 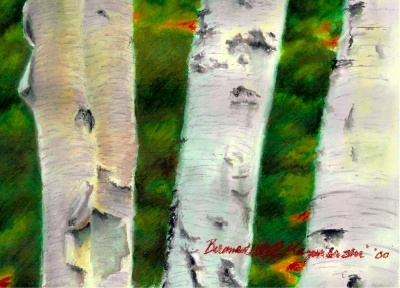 From the time I met the paper birch in our front yard I have always been attracted to the delicately detailed white bark of birch trees which seemed to emit its own faint light in any season. Here, in the darkness of the woods, the grouping of white trunks looks like a crowd clustered for discussion, decorated by a maple branch. 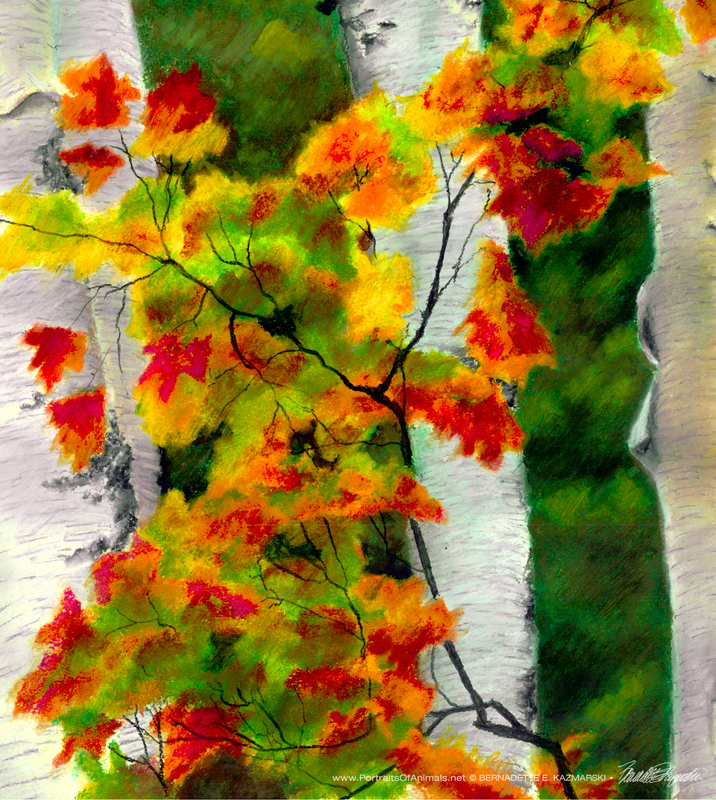 The original of this painting was oil pastel, 24.5″ x 18″, on 300 lb. smooth watercolor paper. The technique was an experiment borne of an off-hand remark from a fellow artist. I had just been experimenting with oil pastels, which at first felt like slippery crayons but soon grew to have their own life as I understood the best ways to achieve the colors and textures I wanted. The artist friend mentioned that you could also work with them using turpentine, either softening the crayons in it or drawing on the paper, then painting turpentine over the oil pastel to blend or spread. I chose to use a combination of these as well as wetting the paper with the turpentine and drawing on that area with the oil pastel. The resulting painting actually looks dimensional, and I know it’s only because of the different textures in the work. 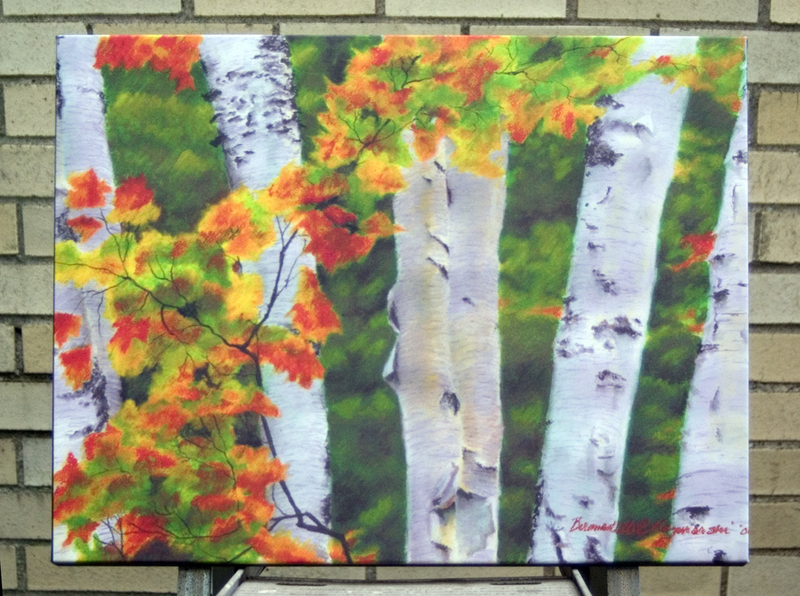 Walking past the painting on my easel was like walking past a window looking out into rainy autumn woods. Birches 1, detail of edge. Prints are available as digital and giclee in archival inks on acid-free art paper and on canvas. 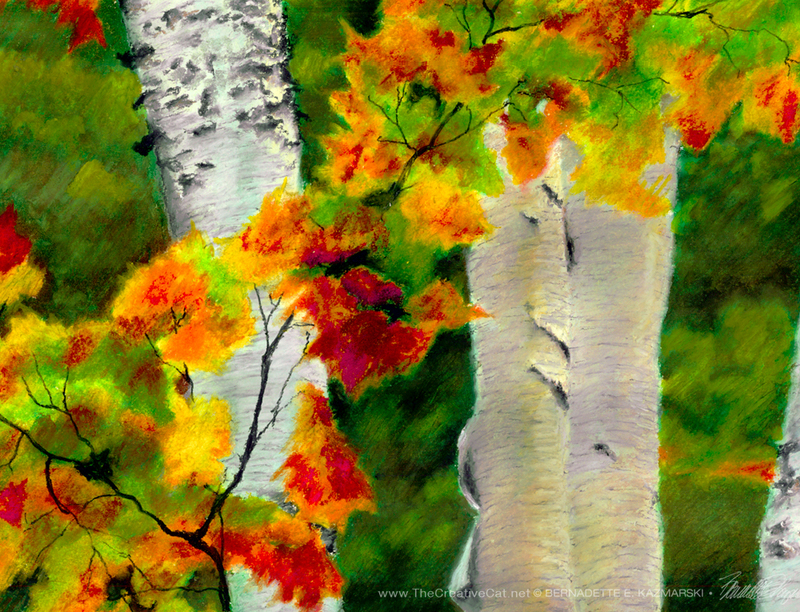 Also see Birches 2: Radiance. They look wonderful as a pair displayed together, either as framed prints or as canvases. 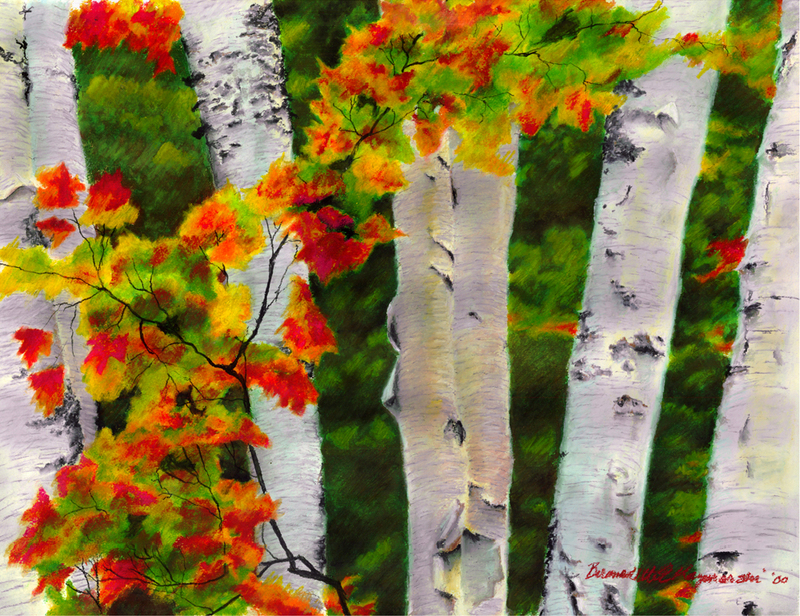 Birches 2: Radiance, watercolor, 22 x 23, edges cropped. Shipping within the US is included in the cost of each print. Prints up to 16″ x 20″ are shipped flat in a rigid envelope. Larger prints are shipped rolled in a mailing tube unless otherwise requested; flat shipping is an extra cost because it’s oversized. 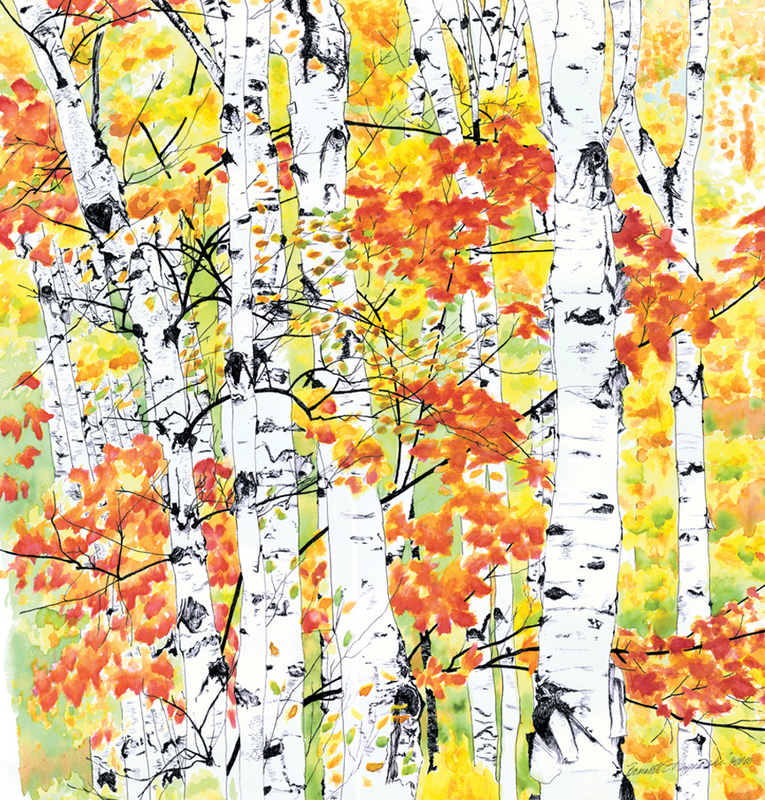 The giclees are printed on acid-free hot press art paper for a smooth matte finish using archival inks. Giclee is the highest quality print available because the technique uses a dozen or more ink ports to capture all the nuances of the original painting, including details of the texture, far more sensitive than any other printing medium. Sometimes my giclees look so much like my originals that even I have a difficult time telling them apart when they are in frames. I don’t keep giclee prints in stock for most of my works. Usually I have giclees printed as they are ordered unless I have an exhibit where I’ll be selling a particular print so there is a wait of up to two weeks before receipt of your print to allow for time to print and ship. Digital prints are made on acid-free matte-finish natural white 100# cover using archival digital inks. While digital prints are not the quality of a giclee in capturing every nuance and detail of color, texture and shading, I am still very pleased with the outcome and usually only I as the artist, could tell where detail and color were not as sharp as the original. Digital prints are only available up to 11″ x 17″ and some of the prints are cropped to fit standard mat and frame sizes. 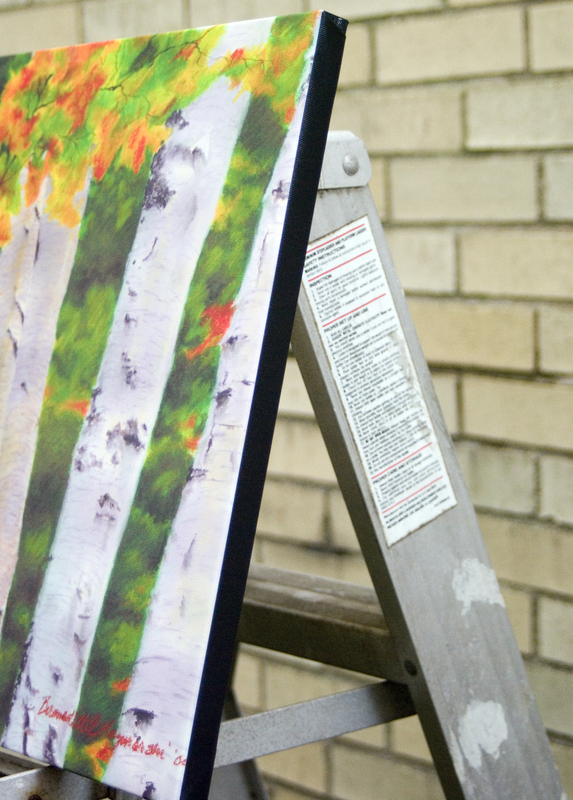 Digital prints have at least 1/2″ around the edges depending on the size of the print. All are countersigned by me. 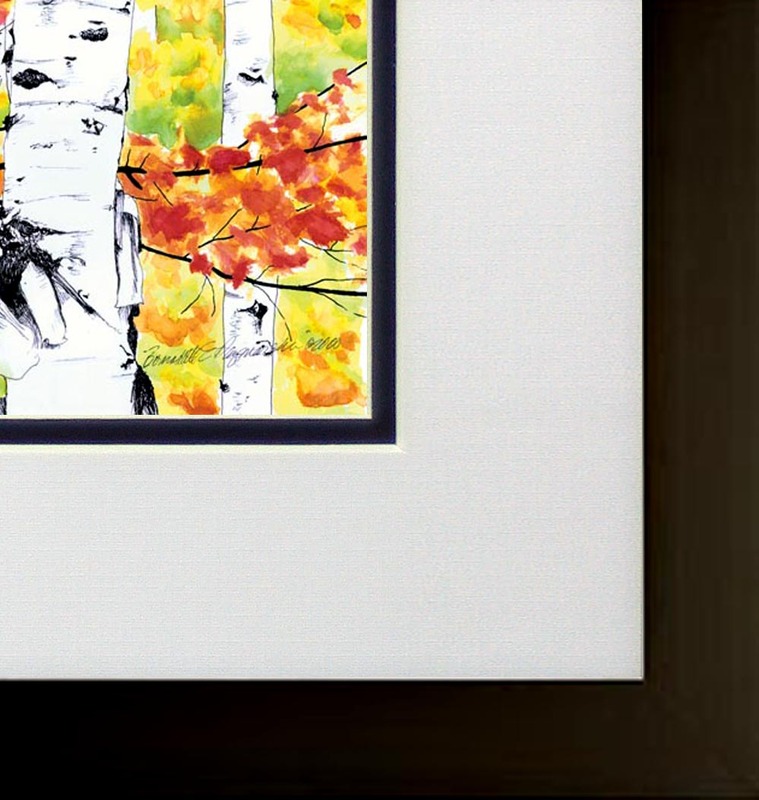 Because the standard size canvas prints are not proportional to the original painting, canvas prints of this painting will have a portion cropped off. I usually have at least one of the smaller sizes of canvases on hand, but order larger ones as they are ordered because I have limited storage space. Smaller canvases are a 3/4″ in depth, Canvases 12 x 16 and larger are 1-1/2″ in depth. I set them up so the image runs from edge to edge, then the sides are black or white or sometimes I slip in a color that coordinates with the painting. This canvas is black around the sides. I do all my own framing and can custom frame a print for you. Please ask. To find all items on this site with the same art or design, use the search box for the name of the artwork and you'll find all that's available. Don’t miss any new items or opportunities! “Follow” the Portraits of Animals blog with the link in the upper left. Sign up to receive posts in email, or in your favorite reader using the links in the right-hand column. You can also sign up for my monthly e-newsletters to receive special discounts and find out where I’ll be with my artwork. Click here for the Creative Cat Preview E-newsletter, for feline and animal-specific products and information. 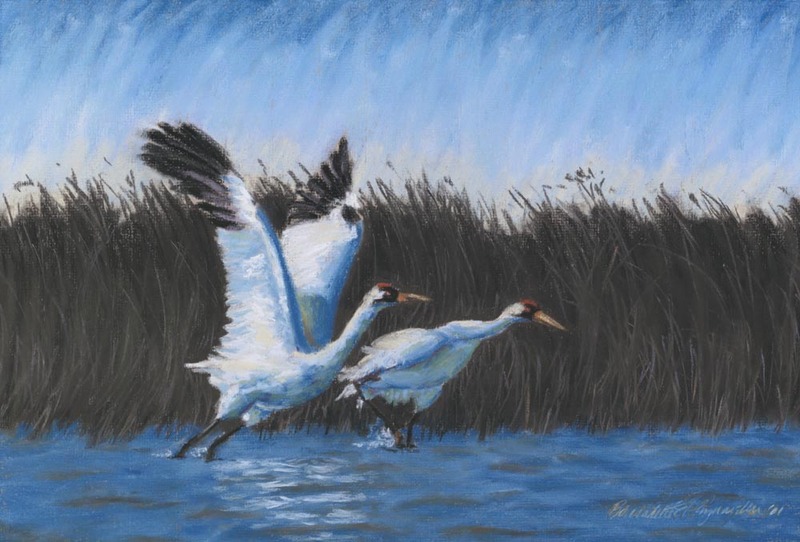 Click here for the Art & Merchandise E-newsletter, for landscapes, nature, urban scenes and more. For art, photos and writing as I develop it, visit my blogs. See feline art and photos as they happen on The Creative Cat, along with feline news, health, welfare, rescue stories and more. See daily photos as I post them on Today. Read poetry, short stories, essays and more on Paths I Have Walked. All images used on this site are copyrighted to Bernadette E. Kazmarski unless otherwise noted and may not be used without my written permission. 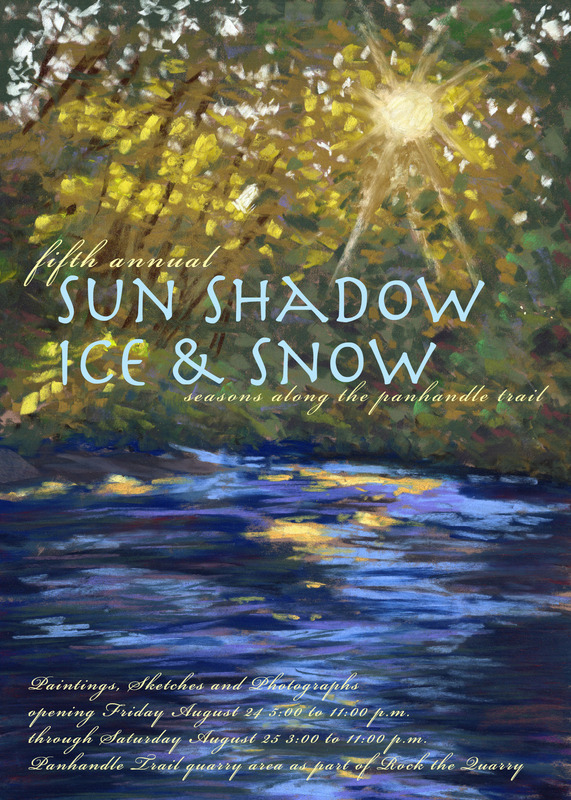 Please ask if you are interested in using one in a print or internet publication. If you are interested in purchasing a print of this image or a product including this image, check to see if I have it available already. If you don’t find it there, visit “purchasing” for availability and terms. 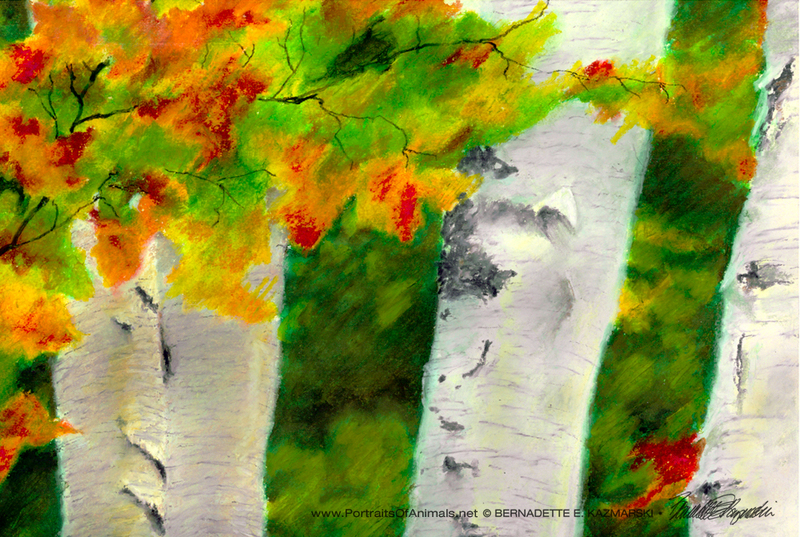 This entry was posted in canvas print, framed artwork, landscapes, nature artwork, oil pastel, prints of artwork and tagged AUTUMN, autumn leaves, autumn woods', birch trees, canvas prints, digital prints, framed art, giclee prints of pastel painting, oil pastel on October 14, 2018 by Bernadette. Don’t see an “Add to Cart” Button on a Product? 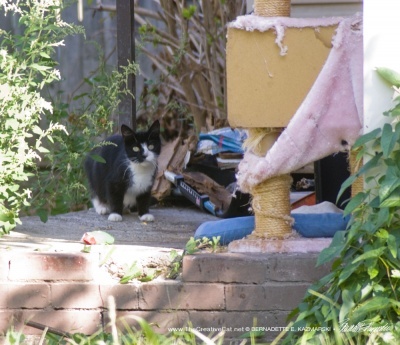 Help me with a TNR project to relocate stray and feral cats from an abandoned building to be demolished. Bernadette Kazmarski is my absolute favorite artist, I have one of her pieces on nearly every wall in my home. One of the things I admire most about her work is her feline art. 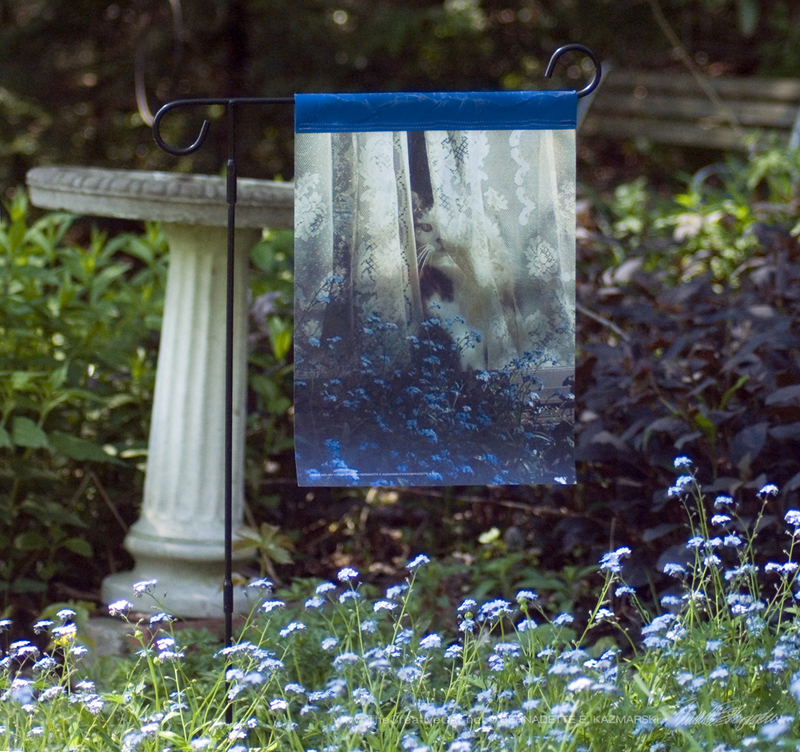 Bernadette is able to capture cats in a very emotional and authentic way. The light and expressions on her feline subjects are so delightful. No animal has captivated us (and the Internet) quite like the house cat. Bernadette's pieces perfectly replicate the joys our feline friends bring to us. Friends and I chipped in together and hired Bernadette to create a memorial of a friend’s beloved cat after kitty passed away. The memorial was beautiful! 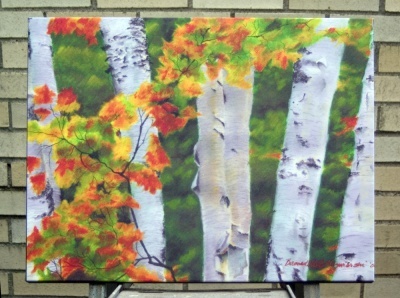 We highly recommend Bernadette’s work. 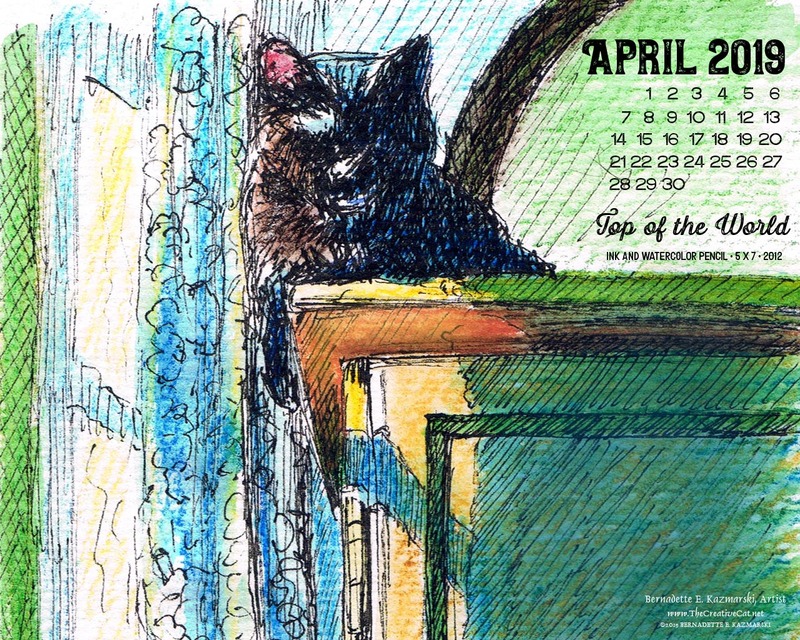 Bernadette Kazmarski is a friend and talented artist who's an avid cat lover just like us! 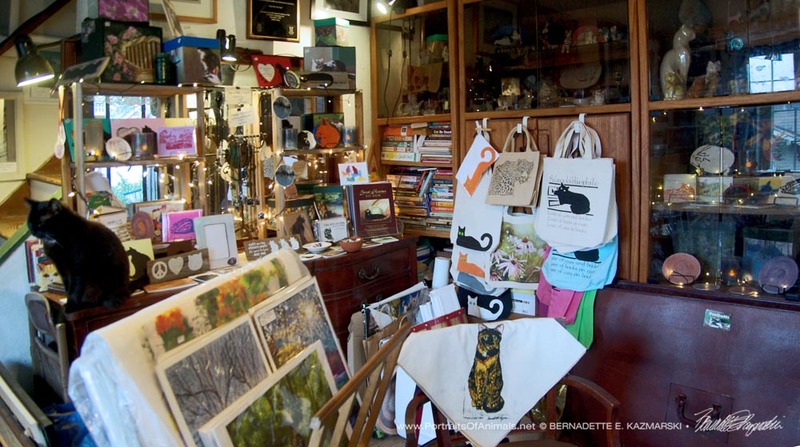 She has created original cat artwork using a variety of mediums, and has transformed her artwork into such useful giftware items as notepads, garden flags, calendars, greeting cards table decor and votives (one of my personal favorites). She's also an award winning writer. Bernadette is a dedicated cat rescue volunteer and remains active in savings cats' lives. 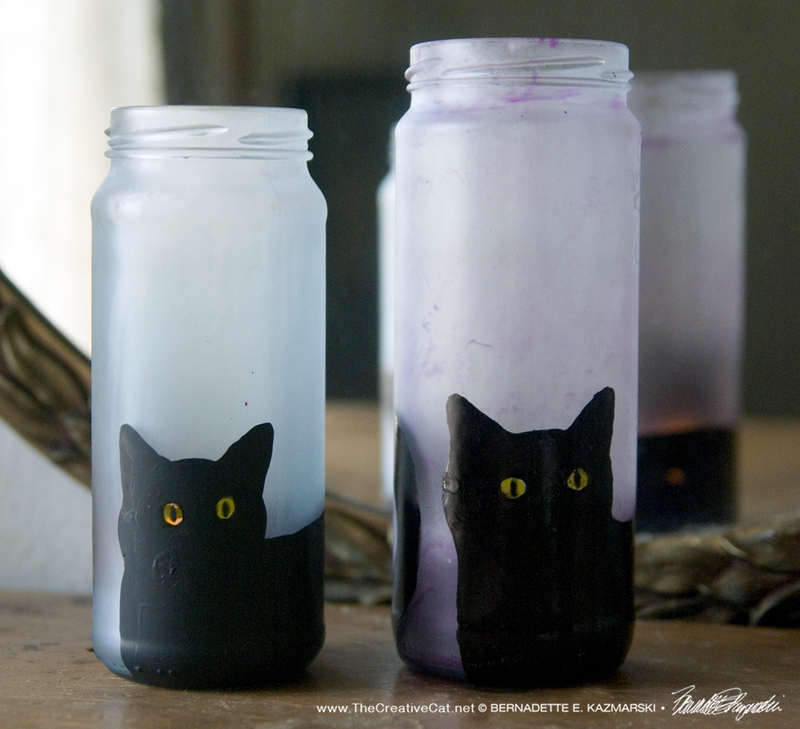 Carolyn Kozlowski, My Three Cats & Co., Inc. I love Bernadette's creativity and style. In addition, when I purchase from her, it is from a wonderful, caring person, not a faceless corporation. 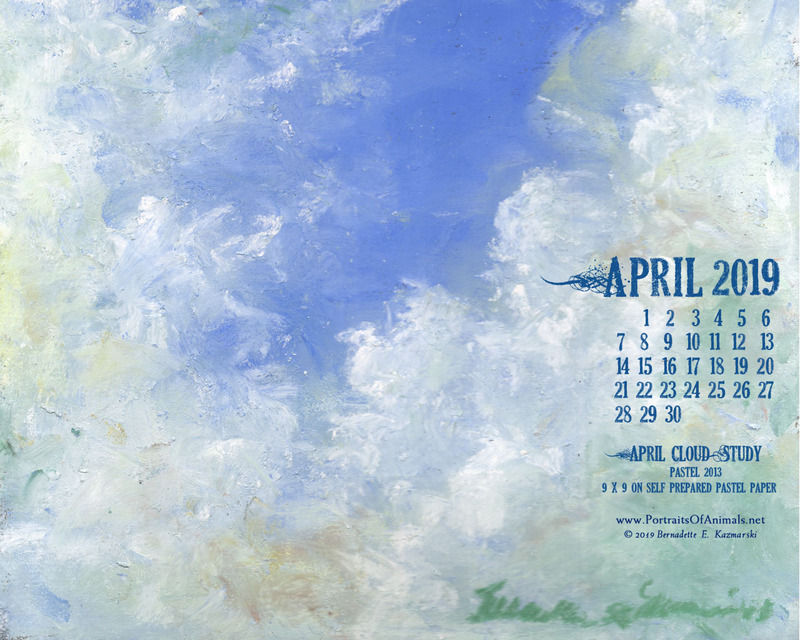 Desktop calendar, 1280 x 1024 for square and laptop monitors. This blog is the living update for Portraits of Animals, telling stories, pointing out what’s new, what’s on special and what’s on clearance. Enter your email below to get regular updates in your email inbox when I post something new. What's New in Bernadette's Studio? All images used on this site are copyrighted to Bernadette E. Kazmarski unless otherwise noted and may not be used without my written permission. Please ask if you are interested in using one in a print or internet publication. If you are interested in purchasing a print of an image or a product including this image, check to see if I have it available already.